Suzhou City Guide. China Travel Services. CTS. Los Angeles. San Francisco. Popular Chinese legend has it that, "In heaven there is paradise, and on earth there are Suzhou and Hangzhou". Suzhou has been praised as a "paradise on earth" since ancient times. Being only 1-2 hours from Shanghai (depending on traffic), Suzhou has enjoyed great prosperity and recognition over the years. The classical and traditional Chinese styles in the local region make it a distinct change from the modernity of nearby Shanghai. Suzhou is one of the oldest towns in the Yangtze basin, founded in about 600 BC. However, its claim to fame actually comes one thousand years later after the Grand Canal was built. 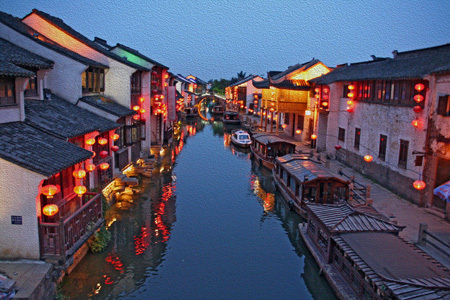 Its excellent location allowed Suzhou to become a prosperous trading area, especially for the silk industry. Suzhou had become the leading silk producer in China by the 14th Century when this quaint retreat became popular with visitors from the imperial court at Hangzhou. Artists, scholars and painters all retreated to this "Venice of the East" to seek inspiration and relaxation. Since then the population has grown to 5.7 million. Suzhou is known for its beautiful gardens, which are designated a UNESCO World Heritage Site, and for its canals. The gardens embody the harmonious principles of Chinese garden design, which dictates that gardens should attempt to create a microcosm of the universe in a confined space. Amongst the most charming are the Garden of the Master of the Nets and the Humble Administrators Garden. The intimate gardens here are particularly pleasant on a misty day, and Suzhou's narrow streets and lanes can be very intimate and relaxing. Suzhou's cultural sites and temples are also worth a visit. Hanshan Temple's distinctive atmosphere and construction are unforgettable. The Temple of Mystery and West Garden Temple are both excellent examples of Taoist and Buddhist tradition respectively. Also, Tiger Hill is a great spot to explore and spend a lazy afternoon in a historical setting. Suzhou's profound cultural and historical background as an ancient capital has helped make this one of China's premier tourism destinations. Traditionally, the people who lived along the Yangtze River were part of the Wu Kingdom. The distinctive culture passed down through generations of these people is still notable in Suzhou today. Music is popular in the local culture, particularly ringing and rhythmical beats with graceful tune-patterns and melodies. Calligraphy is another typical example of Wu culture, as are traditional wood carvings. The characteristics of Wu culture have also influenced the architectural styles of the ancient city. The essence of Wu culture can be seen in various museums throughout the city including the Suzhou Museum and the Silk Museum. Suzhou became renowned worldwide for its embroidery over 1,000 years ago. It is considered one of the most famous of China's four top types of embroidery and is distinguished by its fine workmanship, beautiful patterns, nimble stitching and delicate style. The earliest embroidery was mainly used in costume decoration. According to Anecdotes of Gardens by Liu Xiang, embroidered clothes and leopard skins were worn by Wu people to receive guests during the Spring and Autumn Period (770-476 BC). It was in the early 1960s that Suzhou artisans invented the double-color, double-sided embroidery. The three different types of double-sided embroidery appeared in the 1980s. This technique requires uniform stitching and thousands of knots to be hidden. A tiny mistake on the thin and semitransparent silk may distort the work or change the color. The most difficult technique is to make the embroideries on the two sides similar but at the same time maintain a different pattern. The design of embroidery may be copied from a painting or photo. Various stitching techniques are used to display different artistic effects of this highly skilled art. The gardens in Suzhou originated from the desire to retire from the strife of officialdom and to return to nature and the cultivation of temperament. Taoist philosophy and the refinement of culture underlies the theme of the garden. Hills and water, flowers and trees, pavilions, terraces, towers and halls constitute the basic garden elements, while the prominent tone is expressed in the dark color of roof tiles, the gray of bricks and chestnut brown of wooden pillars. Most gardens in Suzhou were the property of private families. Tranquility, elegance, and harmony with nature contribute to the serenity in these gardens. Accordingly the builders invented ingenious techniques to put limited space to best use. Depressions were transformed into ponds; tiny protrusions were molded into hills; pavilions and chambers were erected according to well-conceived plans, and flowers and trees were planted wherever they were needed to cover the entire area. All this combined to form a natural, yet richly landscaped environment so that the occupants could get the feeling of returning to nature without stepping off the grounds of their home. Such are the unique features of Suzhou gardens. In terms of layout, a limited space is skillfully converted into a kaleidoscopic of themed mini-scenes, which gives ample expression to the ethnic style of the Chinese art of landscaping and garden construction. Suzhou gardens are then nature personified in a nutshell, which enables one to "feel the charm of mountains, forests and springs without leaving the noisy surroundings of the town". The human interest aspect lies in the fact that the architect, philosopher, poet, painter and common people can grasp their own needs in a visit, to sense an idea, the essence, the lines and the rhythm. The unfolding of the garden vistas is the pattern of a landscape scroll. The garden setting is conducive to the most natural inspiration when enjoying tea, literature, flower arranging or playing a musical instrument. Suzhou gardens are one of the best ways for tourists to get a better understanding of ancient Chinese culture and civilization. Tiger Hill Park is simply one of Suzhou's greatest attractions! Within the park walls are many great sights filled with history and legend, which makes it a great place for a picnic or an afternoon of exploration. Tiger Hill (Huqiu) is the final resting place of the ruler of ancient Suzhou, He Lu. The area was named Tiger Hill after a tiger was seen lying on He Lu's tomb. One of Tiger Hill's most famous spots is Sword Pond (Jianchi). He Lu was a famous warrior and sword collector and the Sword Pond is said to hold He Lu's treasured swords in its watery depths. Tiger Hill also houses the Yunyan Pagoda, which has been leaning since before the Qing Dynasty. This 1000-year-old (from the Sui Dynasty) pagoda has become a popular landmark of Suzhou. Wanjing Villa is a garden of preserved landscapes and "bonsai-style" shrubs, covering an area of about 1700 square meters. Some of the potted landscapes are actually quite small and some are not potted at all but are small displays set up like miniature Suzhou gardens. All are intended to conjure up images of marvelous mountain and forest scenery. The seven-storied, octagonal Slanting Pagoda on top of Tiger Hill is also known as Pagoda of the Yunyan (Cloud and Rock) Temple. First built in 959 AD, or the sixth year in the Xiande Reign from the Zhou Dynasty of the Five Dynasties Period (907-960 AD), it is a brick and wooden structure in the style of a 47-meter-tall Chinese chamber with curving lines. Its seven floors gradually diminish in size from bottom to top. Dimly lit fishing boats 'neath maples sadly lie. The tone of the poem is set in such perfect harmony with the sound of the bell that, as the lines became popular, Hanshan Temple gained a reputation that goes beyond China to foreign countries. Suzhou's Temple of Mystery (Xuanmiaoguan) is more than just another Taoist Temple. It is Suzhou's most active place of worship and houses a great collection of Southern Song Dynasty religious statues. The most important hall in the temple is Sanqing Hall, which is dedicated to the main gods of Taoism with Tianshanglaojun most prominent. The statues here are great works of art with intricate detail, excellent scale, solemn facial expressions and dignified postures. These statues, some of which are 17 meters high, are some of the best examples of Song Dynasty religious sculpture existing today. The temple also contains a collection of stone carvings, preserved paintings and calligraphy from the Tang Dynasty. West Garden Temple (Xiyuan Si) is one of Suzhou's active temples as well as being a beautiful garden. There is a pond in the garden section of the temple where Buddhist worshippers have placed fish and other wildlife. The creatures are ritually "set free" into the pond and cared for by the temple. In the temple section of the complex, the Hall of the 500 Arhats is particularly interesting. In the center of the Hall stands a 13-meter high statue of Guanyin Bodhisattva with 1000 eyes and 1000 hands, made of a single piece of sandalwood. Nearby is also a unique Buddha statue whose head has four faces with four different expressions. It is said that the four sides represent the four sacred mountains of Chinese Buddhism and these buddhas worshipped at each sacred mountain. As a result of hundreds of years of culinary experimentation, Suzhou cuisine has developed a unique flavor and a famed reputation. Each course is individually prepared and the emphasis is on the use of quality ingredients, tender meat, fresh vegetables and care in preparation. The result is a selection of fabulous dishes that are unique in color, aroma, shape and taste. Suzhou cuisine is often sweet to the taste and beautifully presented. The fish and vegetable dishes of the area are well known throughout China and some of the best local delicacies to try are; Songshu Guiyu (Mandarin Fish, stewed and fried), Qingtang Yuchi (braised shark's fin in a clear soup), Xiangyou Shanhu (stewed shredded eel) and Xigua Ji (young chicken buried in watermelon rind and steamed). The best places to taste delicious and authentic Suzhou cuisine are on Gangzhou Road and near the middle of Renmin Road. The snacks in Suzhou are also very tasty. Try the bean curd cakes with honey, pine nuts in syrup, melon seeds fried with rose juice and sesame cake with mashed date. International cuisine has made its way to the city restaurants, largely thanks to the fact that Suzhou is a tourist town. The large hotels offer well known western dishes and there are also a couple of smaller independent restaurants around town which offer continental cuisine. Handicrafts and silk are the most treasured native products of Suzhou. Arts & crafts represent a unique cultural style, with workmanship that developed over a thousand years under the influence of the Wu Culture. Most representative of Suzhou style are embroidery, fans, national musical instruments, scroll mounting, lanterns, mahogany furniture, jade carving, silk tapestry, traditional painting pigments of Jiangsixutang Studio, the New Year's wood-block prints of Taohuawu Studio, etc. These are marked by exquisite craftsmanship and elegant colors. Suzhou Guangfu Airport is a small airport with very limited service. Most travelers fly into Shanghai and then transfer to Suzhou by car (around 1-1/2 hours) or by train (about 1 hour). Buses to Nanjing, Shanghai and other major cities are plentiful but buses may cost slightly more than a comparable train ride for about the same amount of time. The buses to Nanjing pass through Wuxi, Changzhou and Zhenjiang and then on to Nanjing along the Shanghai-Nanjing Highway. There are two long distance bus stations in Suzhou, at each end of Renmin Road. Suzhou is an important city on the Beijing-Shanghai Railway line and more than 20 trains stop at the Suzhou Railway Station everyday, which is on the northern side of the city. Trains to Shanghai take about one hour; trains to Nanjing and Wuxi take about two hours. The city of Suzhou is along the Grand Canal and therefore accessible by boat from various cities along the canal, such as Shanghai, Zhenjiang (in Jiangsu Province) and Hangzhou. Although the boats traveling along the Grand Canal are not always the most comfortable, this can be a nice way to travel. Suzhou is small enough to walk around. The best way to see the sites is to hire a bicycle (ask in your hotel). There are numerous buses and taxis also operating in the city.